A great learning experience no matter what your age or level of expertise! 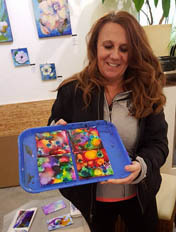 Spokane's "New Moon Art Gallery" offers an array of fun & playful creative art classes at our East Sprague gallery that will nourish your heart, mind, and soul, including mixed media & painting, plus a variety of jewelry design classes which encompass many of the aspects of jewelry making, and many more art workshops in a variety of mediums. All our classes are taught by accomplished artists and artisans, many of whom are tops in their field. 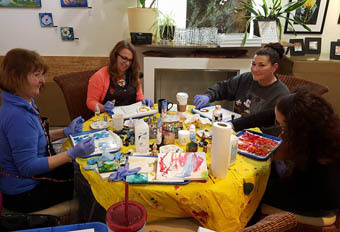 Whether you are just beginning to tap your "inner artist", or are looking to sharpen already existing skills, you'll thoroughly enjoy your Moon Gallery experience. 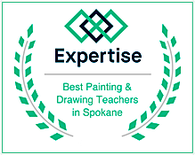 We are always adding new classes, so be sure to regularly visit this page to learn about our upcoming Spokane art and craft workshops. We are at 1326 East Sprague Avenue ~ view this [MAP] for our gallery location. ​or call 509-413-9101 (leave a message if we're away, then we'll get back to you). ~ PayPal accepted online (see form at bottom of page) - cash, checks and credit cards accepted. Learn basic enameling, painting, and cloisonne. Make a miniature work of art on copper. Basic materials and tools provided to make three pieces. Additional copper blanks and findings may be purchased at the workshop. 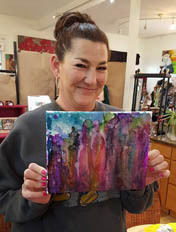 Check back for the next Runny Paint Class dates! You'll learn (more than one) way to create unexpected abstract designs on wrapped canvas. Just show up with your paint clothes or an apron and we'll provide the rest: the paint, the gloves, the canvas, and the instruction. At the end of the class, you'll have your very own 9x12 wrapped canvas creation to take home. Past attendees have taken what they've learned and are experimenting on their own (for $5 extra, you can bring your own larger canvas, up to 16x20). "What a beautiful experience. I feel so inspired! Thank you so much for what you do." Please Note: Payments for class fees are non-refundable unless cancelled or rescheduled by the New Moon Art Gallery. Please note: For class fees not listed here, you can combine 2 of the PayPal amounts below. For example, for $90 send  $45 ; for $75 send  $45 and  $30, etc. ...and don't forget, when you join our mailing list we will keep you up-to-date with advance notice about Moon Gallery workshops, classes, shows, artist receptions and more! 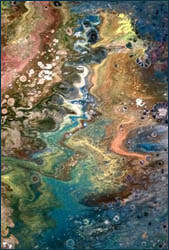 Would you like to have a Moon Gallery "Art Party" at your own home or office? Or if you prefer, the party can be hosted at our gallery on East Sprague ~ it's a great time to share creative experiences with your friends, family or co-workers!